(Nanowerk Spotlight) Carbon nanotubes (CNTs) being highly electrically conductive along the tube axis, have gained great research interests in recent years for connecting two conducting electrodes at the nanoscale – where the CNTs can be integrated into a micro- or nanoelectronic system. "CNTs don't have any permanent dipole moment, and therefore, they do not interact with a uniform electric field," Basu explains to Nanowerk. 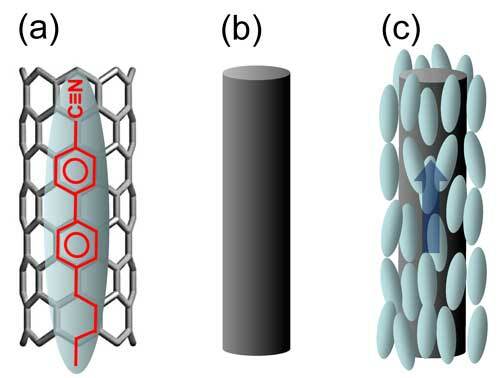 "When a small quantity (∼10-3 wt%) of carbon nanotubes is doped in a LC, the LC molecules self-assemble themselves at the CNT surface due to π-π electron stacking, creating pseudonematic domains (PNDs) surrounding the CNTs." See Figure 1. When the E field increases – i.e. the voltage is ramped up across the cell – the PNDs start to align along the field, and the CNTs being embedded in the PNDs, also follow the rotation. During this rotational process, multiple PND-encapsulated CNTs find each other and form a wire-like structure due to their natural tendency of entanglement.